What the heck is a canister filter? A canister filter is a pretty common type of aquarium hardware that is used to continually filter large volumes of water without having to hang on the back of your aquarium. 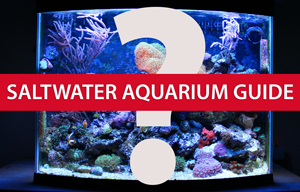 A canister filter on a typical aquarium looks like a canister, which is where it gets the name. It is typically cylindrical or rectangular, looking like a canister that has tubes sticking out the top for intake and output of water that is being filtered through the unit. Filter pads and media are housed inside the canister unit. The water passes through various types of media inside the canister filter which may or may not include activated carbon, filter pads (both coarse and fine), phosphate control media, chemi-pure, rowaphos or other types of media that keep water quality in check. The water is then sent through the output tube, which also probably wraps up behind the tank and back into the aquarium. It’s actually quite simple, but this type of filtration is powerful because canister filters on typical aquariums (say 55-200 gallons) can filter between 100 and 200 gallons per hour or even more depending on the size of the aquarium and power of the filter itself. If you are in the market for a canister filter you will probably find the gallons per hour (gph) to be one of the more common specs you will compare on different models. Canister filters are not a “set it and forget it” type of hardware. You will need to maintain your canister filter to keep it running optimally from day to day. If you don’t keep excess waste from building up unnecessarily inside the filter, you will find that it can even have the opposite effect of cleaning your water, which is not a good thing. Typical canister filter use would probably require that you clean it out every 2-4 months, depending on factors such as how much fish waste you need to deal with and what type of water quality you are shooting for. I like to clean mine out every month or two, which keeps excess detritus and waste from causing me any problems, and my canister filter is easy to remove from the tank and clean so it’s not too big of a hassle for me.